What is the Smoke Alarm Program? Smoke alarms save lives! In the event of a fire, a smoke alarm is your first line of defence. The Smoke Alarm Program provides and/or installs smoke alarms free of charge to homeowners in specific residential communities around the city. Edmonton Fire Rescue Services (EFRS) will not retain information from the safety check except to document the number of smoke alarms provided or installed. Sleeping Areas = CO Alarms. All Levels = Smoke Detectors. Have working smoke alarms on all levels of your home? 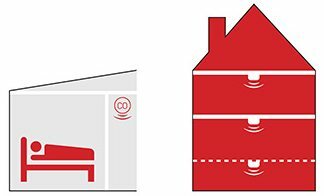 Have carbon monoxide alarms outside all sleeping areas? Dust the outside of your alarms periodically? Have a home escape plan and periodically practice it? Have house numbers clearly visible from the street? A properly installed, fully-functioning smoke alarms cuts the risk of dying in a reported fire by 50%, according to the National Fire Protection Association. Thank you to Interstate Batteries for providing batteries for the program.